The Arizona Geological Survey (AZGS) is charged with informing the public about Arizona’s geologic setting, and its mineral, water, and energy resources. In 2007, State Geologist M. Lee Allison created the Geologic Extension Service (GES) to better meet this charge. A chief goal of the GES is to reach out to the community and inform them of the products and services of the AZGS and to make those products and services readily accessible. In short, GES is a bridge between AZGS geoscientists and the Arizona public. We design, develop, and deploy educational and outreach materials to assist people in developing a better and more robust understanding of those Earth processes that shape the Arizona landscape and enrich our natural resources. Our primary outreach platform is the AZGS website, but we also participate in on-site outreach at schools, group meetings, and civic events. 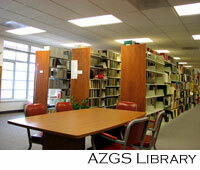 The Geological Extension Service comprises the AZGS Library, the AZGS Website (www.azgs.az.gov), our science outreach program complete with select geoscience educators links, and the AZGS Tucson Bookstore. The Service is located within the AZGS offices 416 W. Congress, Suite 100, Tucson, AZ 85710. For more information call 520.770.3500 or email inquiries@azgs.az.gov. This page is best viewed with Firefox | For website feedback: Web@azgs.az.gov | Copyright © The Arizona Geological Survey, 2010. All rights reserved.